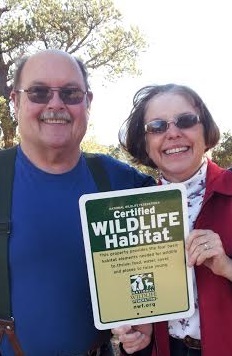 News Flash: The National Wildlife Federation has certified our property as a Wildlife Habitat! What does our new certification status mean? It means that we provide adequate food, shelter, and water for the local assorted critters—in our case, enough assorted birds to make Tippi Hedren nervous, ground squirrels, rabbits, chipmunks, bobcat, deer, brown bears, and more that don’t come out when our dogs are patrolling, although our dogs gave up catching anything long ago. My husband and I found the application in a catalogue, paid to have our facilities certified, and voila! NWF even mailed us a press release form we could use along with our official certificate and permission to purchase a weather-proof Wildlife Habitat sign. However, I would suspect that any sign we erect too far from the house will simply be a target for hunters sighting in their weapons. Human nature. Why would we bother to be certified when the certification doesn’t come with any benefits other than permission to hang the sign? Good question. For us, when everyday life with people becomes disappointing, we’re soothed by the sight of an ever-changing array of wild birds and animals that are present in our yard of their own choice. We enjoy the sense of our being a piece of the greater cycle of life. Finally, we enjoy the fact that for the brief moment in which we own and occupy our space, we provide a sanctuary of sorts for animals that have been rudely shoved aside by development. We have the illusion that we’ve done something. Gardens, yards, church property—any space with the required elements can apply to be certified. The small fee assessed helps sustain the work of the National Wildlife Federation and balm the ragged consciences of people who bulldoze away most natural habitats. The most painful cost of feeding the birds has been the way our seeds have lured one or more wood rats into our attic. Big gag factor. He or she or they have created a nest in the exhaust fan in the ceiling of our bathroom, and I’ll spare you the details of what happens when a rat piles sunflower seeds and excrement around his or her nest at the edge of the slots that are supposed to transport air. Plunk, plunk, plunk. We cleaned and sealed and sanitized, but we had to wait for live trap cages to arrive in answer to our online order to try to remedy the situation. I hope the traps work. The alternative is a mailbox-shaped trap that electrocutes the inhabitant—over and over again since rats can re-start their hearts. My husband decided that we didn’t want to be celebrating the new year and have the lights flicker ominously. Shades of The Green Mile! This business of co-existence is complicated. This entry was posted on December 29, 2013 by Personal Journeys with Gramma in Life Stories and tagged Bird, featured, Habitat, Life Stories, National Wildlife Federation, Rats, Rodents, Sanctuary, Wildlife.